• After receiving the presentation papers by study area (metal arts, ceramic arts, wood painting arts, textile and fashion, arts theory, glass arts, jewelry, creative work, transmission of culture, convergence and etc), the session will be divided according to the study characteristics. The study characteristics include education, policy, materials & methods, artworks & artist, industry and etc. • Sponsored by : Ministry of Trade, Industry and Energy, Ministry of Culture, Sports and Tourism, Busan Metropolitan City, broadcasting stations and mass media organizations. • Starting from this symposium, we are to award the best prizes for presentation of the study and the best prizes for the works per area, so please do participate in the symposium. 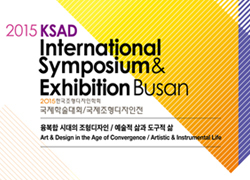 "2015 International Art & Design Exhibition <Busan>" is the first international exhibition organized by a corporation, the Korea Association of Art & Design, and it is the third, important international exhibition organized under the Korea Society of Art & Design. Throughout the years, around 1,000 members of the Korea Society of Art & Design in the country have accumulated their knowledge and experiences for about 20 years, developing it focused on the academic researches. However, the Association is newly established to widely open a window of cultural exchanges towards and for the global world. Simultaneously, it intends to actively support creative artists with active intelligence and courage through continuous international activities and exhibition exchanges. ∘ Location: Design Department Exhibition Hall, Dongseo University, Busan, Republic of Korea. Bringing in the Works & Display until 12:00 pm. However, the artist should be responsible for bringing in/out the real-size works to be displayed. - Image of the Work: Upon the primary application, the entry can be submitted using images of similar works and esquisse. ∘ Providing a certificate for participating in an international exhibition of 7 or more countries ∘ 2 copies of the work book ∘ Offering an opportunity to hold a meeting with the author ∘ Providing opportunities for the next international exhibition and symposiums. ● Starting from this symposium, we are to award the best prizes for presentation of the studies and the best prizes for the works per genre, so please do participate in the symposium. Note: All the artists and authors submitting real-size works should be individually insured, and please note that the Association has no legal responsibility regarding the works when they are destroyed or damaged upon delivery, exhibition and bringing out. ▪ The work deliberation committee will award a grand price and an excellence award per area among the submitted works, so please take part in the exhibition. ▪ The works will be collectively printed out by the Society and no works will be returned. Note: All the artists and authors submitting real-size works should be individually insured, and please note that the Association has no responsibility for compensation of the works when they are destroyed or damaged upon delivery, exhibition and bringing out.